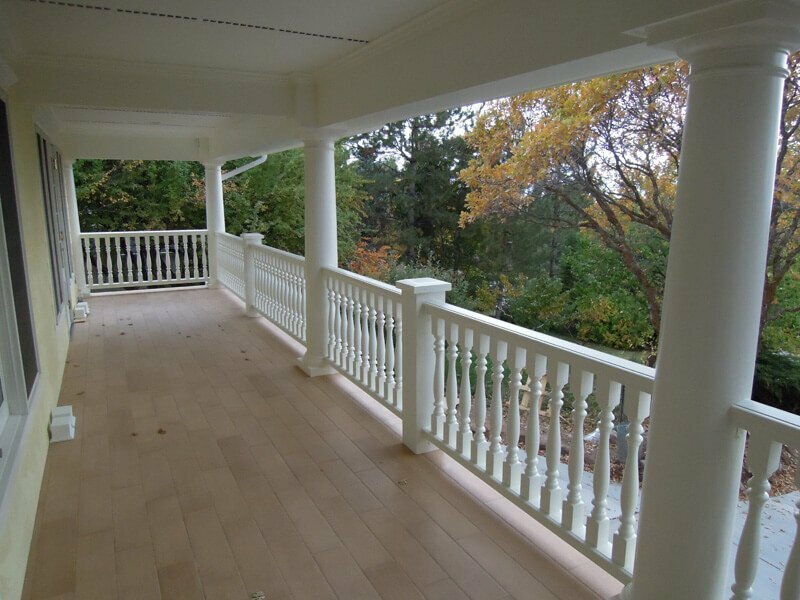 Royal Corinthian manufactures polyurethane balustrade systems, which is a high density product that looks like wood but will not rot, crack, or split. These balustrades come primed ready for final paint finish on the jobsite. They are structural and have been independently tested to exceed both residential and commercial building codes. 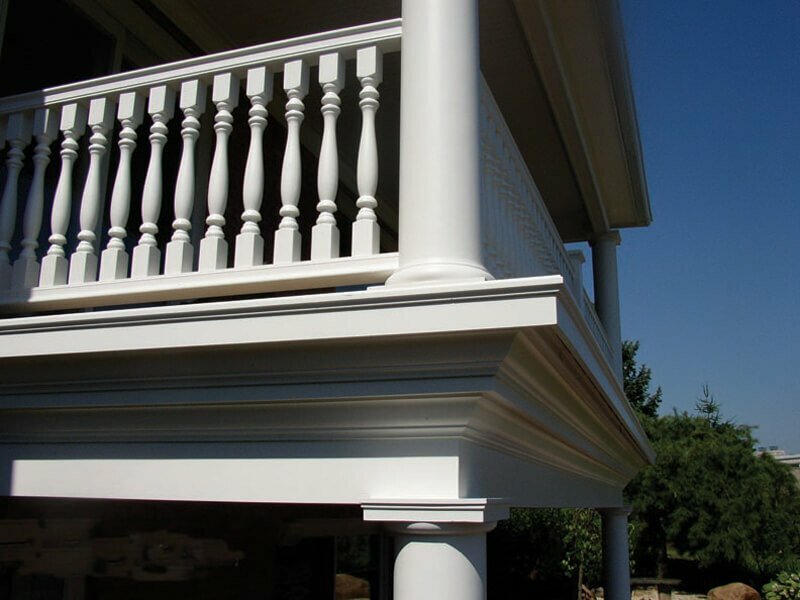 These balustrades offer the greatest advantage over our other balustrade systems when a very lightweight, structural, paint-grade balustrade is desired but is limited up to 12’ spans before requiring a newel post, column, or support. 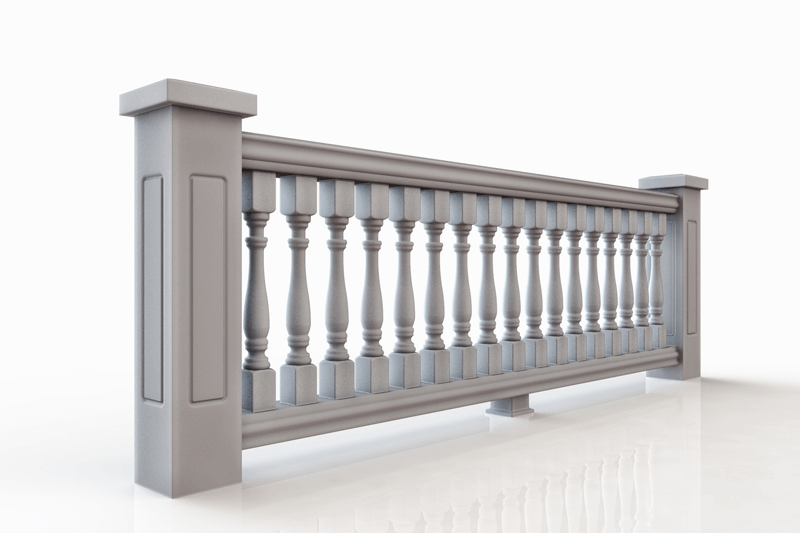 RoyalThane balustrades are a molded product. We use a two part foam that begins to expand when mixed together. The word “foam” often scares people but this foam achieves the density of white pine or roughly 12 lbs. per cubic inch. In other words, polyurethane is rigid foam that will feel like wood but not come with the negative attributes. In order to virtually eliminate any air pockets, we use a state of the art metering machine and avoid mixing by hand. Prior to pouring in the two part foam, we spray our molds with high-end exterior primer which insures that the primer adheres to the product better than possible when spraying once the product is demolded. 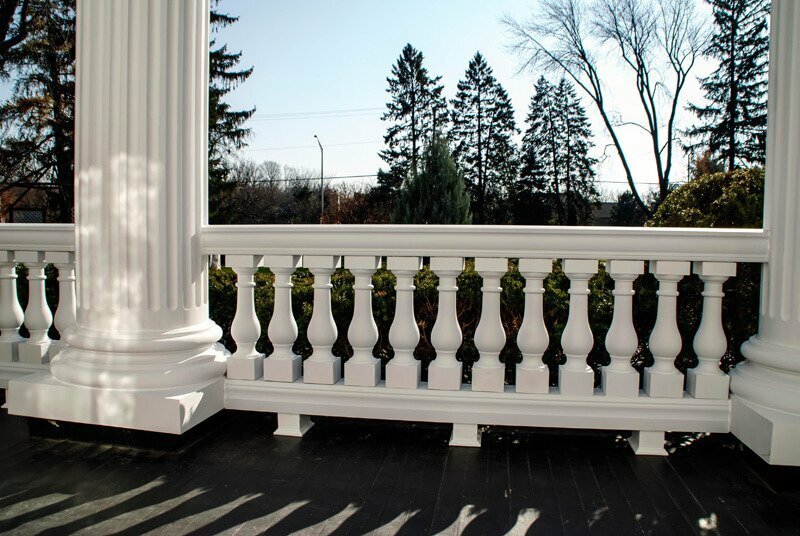 All of our RoyalThane structural balustrade components are reinforced internally with PVC or galvanized steel pipe in order to insure we surpass building codes for both residential and commercial applications. The end product is a fully primed, ready for final paint finish and assembly, high density polyurethane balustrade system, weighing from 5 to 40 lbs. per lineal foot. 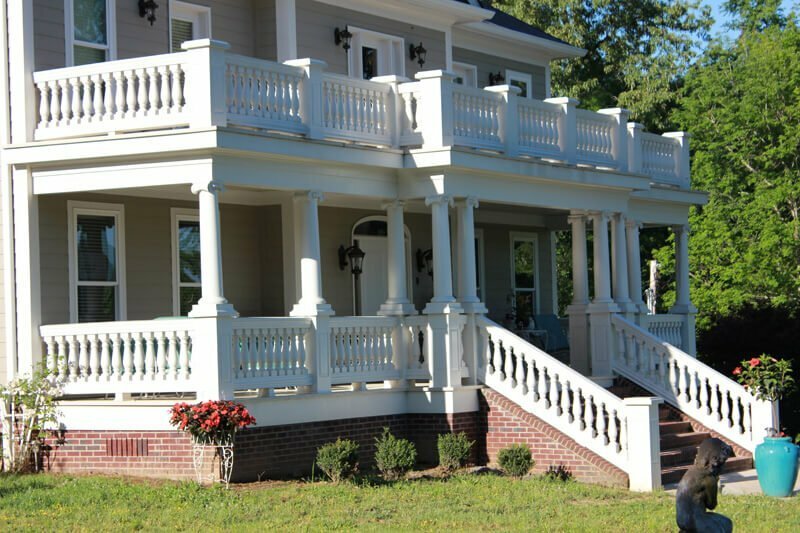 Our RoyalThane balustrade system is comprised of balusters, top and/or bottom rails, newel posts, post caps, and the hardware necessary to install all of the components. We have spindles that range from 2” to 8” wide and up to 40” tall which can result in short decorative systems as well as systems tall enough to meet pool fencing requirements. Our rails come in 4-1/4”, 6”, 7”, 10” and 12” widths and can span up to 12’ in length. We typically send out our rails in 8’, 10’, and 12’ lengths as per industry standards. These rails can be cut to length using standard wood working tools on site or we can factory cut them to size on your behalf. We offer newel posts, both plain and with raised panels, in varying heights and widths. 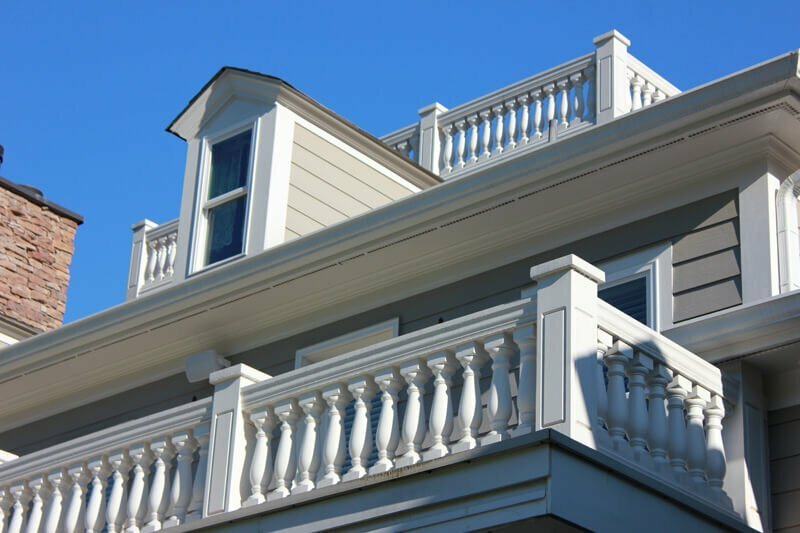 Our balustrades can be adorned with a variety of trims, balls, and finials and can contain the wiring of your exterior lighting systems. System Widths Up to 12"
System Heights Up to 51"